Happy Wednesday everyone! I hope you all are having a great week and are gearing up for Christmas! I am OH so excited about Christmas this year! We are spending Christmas Eve with my husband's side of the family, and Christmas Day with my side of the family. I can't wait to celebrate the birth of our Savior with family, good food, and my favorite Christmas movies! I thought I'd do another Daily Manna post this week, holiday style! I've been keeping up with my workouts and it's become such a regular part of my routine, which I am grateful for! And the 21 day fix workouts make it so easy because they are only 30 minutes and VERY easy to fit in to my busy day! Yesterday morning, I did the upper fix extreme and then downed my Shakeology! It was sooo yummy! 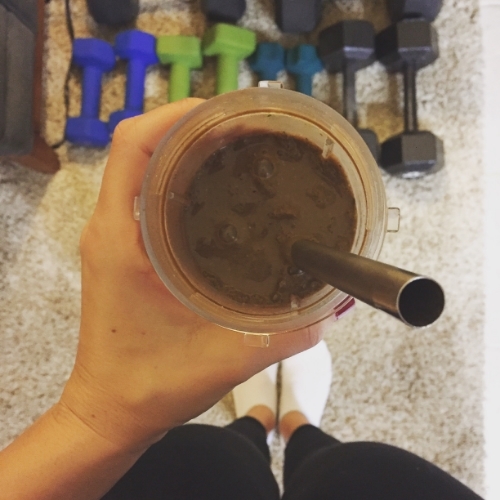 1 scoop vegan chocolate blended with coconut milk, ice, and a handful of spinach! I also had some extra time in the morning and decided to make spelt blueberry banana pancakes with PB smeared on top and strawbs on the side! These turned out SO fluffy and delicious! I'll have to post the recipe soon! 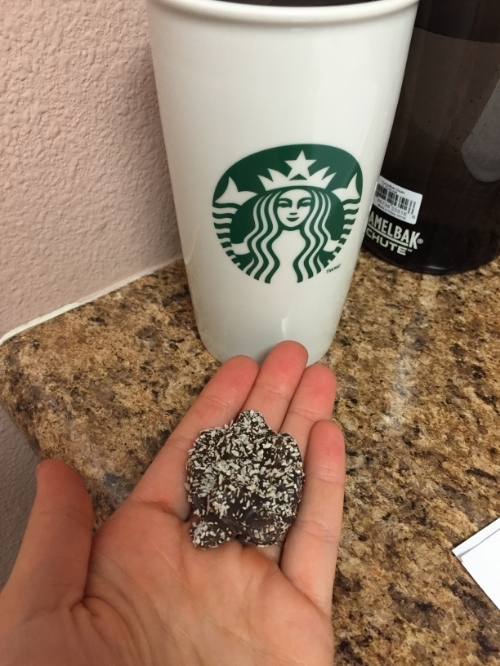 There were SO many treats at work yesterday, so I indulged in a dark chocolate coconut cashew bite. SO good with my coffee! 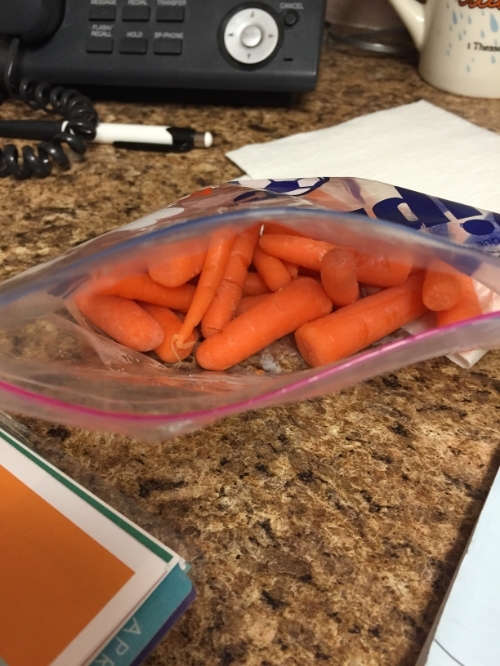 And of course, my daily baby carrots! Along with 6000 pounds of chocolate, one of my patients also got me this beautiful necklace as a Christmas gift! It was so sweet! I love being a part of these peoples' lives and helping them get through a difficult time. Working as an online wellness coach, as well as a dietitian at a dialysis center, has put me in a position where God can use me to positively impact others. All of the treats and the beautiful gifts yesterday were just yet another confirmation that God can even use someone like me who is broken, but redeemed, to love on others. I know He has me where He wants me in this season of life, and for that I am grateful. Lunch was a HUGE salad with cilantro dressing and some chunky veggie marinara with chickpea fritters! These fritters didn't turn out quite as great as I wanted, so I will keep testing it out and share a recipe soon hopefully! In the afternoon, I also had an apple and nuts but forgot to snap a pic! I had to work later than usual yesterday and knew I would need an extra snack to get me through the afternoon! When I got home, I vegged on the couch for a bit, and then got to cooking! My hubby and I snacked on these veggie and flaxseed chips with some hummus while we cooked! Dinner was some roasted sweet potatoes with a one-pot-wonder I improvised: zucchini, eggplant, broccoli, kidney beans, and diced fire-roasted tomatoes, with some cumin, salt, and red pepper! Oh and garlic, always garlic! The night ended with my husband and I getting sucked into yet another show: The Man in the High Castle! SO GOOD but so disturbing at the same time. I can't wait to keep watching and see what happens! It was a rainy and relaxing day yesterday with some good, healthy eats as well as some treats mixed in there! I've been learning the art of balance this month, and it's been, without a doubt the healthiest thing I've ever done. More on this later as I am still processing and learning and journeying, but all I can say is God is SO good, Christmas is 2 days away, and I am so excited for what is in store for 2016!